Indonesia - The sky turned yellow just before the 2015 peatland fires reached their height in Kalimantan, Indonesia. Then it turned dark, like a phantom’s mask covering the island of Borneo with thick, humid brown haze. The particles in the air were so dense that people’s eyes burned and it became difficult to see, and so toxic that a nine-year-old girl riding her bicycle to school suddenly collapsed in the middle of the road. The Indonesian community leaders invited to speak at the Global Landscapes Forum: Peatlands Matter event in Jakarta on 18 May begged to differ, sharing their unique perspectives on what it is like to live within peatland ecosystems. Peatland communities throughout Indonesia have had to re-learn how to live peaceably with their environments. It is estimated that peatlands contain nearly twice as much carbon as all the world’s forests combined, despite the fact that they cover only 3-5 percent of the world’s surface, making them saving graces for climate control when protected, but terrifyingly destructive when burned and carbon dioxide is released. Agricultural peatland communities have long cleared their land primarily through controlled burning, by selectively burning sections of land at a time, relying on the peat’s moisture to keep fires from blazing out of control. The ashes would fertilize and balance the highly-acidic soil. 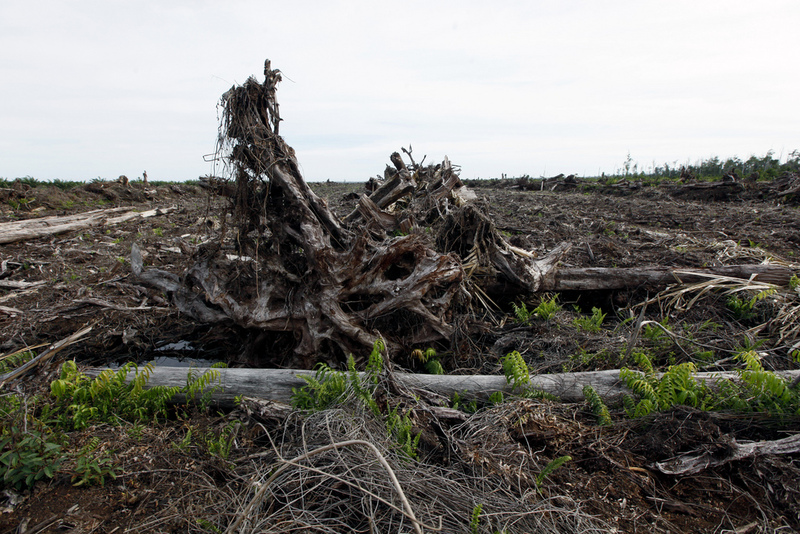 However, the development of cash crop plantations like palm oil that require the drainage of peatlands, combined with rising temperatures from global warming, have rendered peatlands into tinderboxes. Despite re-wetting mechanisms – such as digging out canals that can be blocked to flood the land – the agricultural method of controlled burning is now dangerous, unpredictable and unsustainable. Peatland communities are now facing a conundrum of developing new ways to profit from their native landscapes while ensuring their sustainability. As was illuminated at the Forum, there’s no one-size-fits-all solution – the closest one may be bringing communities together to share best practices on peat management and restoration. In 1980, Akhmad Tamanuruddin was uprooted from his home in East Java as part of the Indonesian government’s transmigration initiative to unify the country by spreading Javanese culture across the archipelago. He was relocated to Palangkaraya, the provincial capital of Central Kalimantan, where he was given two hectares of peatland. When he wasn’t in a classroom working as a schoolteacher, he worked on his property, trying to coax it into productivity. He was, however, aware of the harmful effects of burning. Driven by curiosity, Tamanuruddin began searching for an alternative and tinkering with soil mixtures that he could scatter atop his land – something akin to icing on a cake – to increase its fertility. He stopped burning altogether in 2004 – 11 years before Indonesian president Joko Widodo banned not just peatland burning, but peatland clearing altogether, as well as the conversion of recently burned land. Tamanuruddin had developed a solution long before he was legally required to do so. It’s not a perfect method. Five cubic meters of his special concoction is enough for one hectare of land, but converting large areas means trucking in mass amounts of outsourced soil and developing adequate roads to do so. This homegrown approach to turning peatlands into profit demonstrates an enterprising spirit that’s required to tackle peatland challenges on a local level. Few people demonstrate this drive better than Emmanuela Shinta, a 24-year-old documentary filmmaker and founder of the Ranu Welum Foundation, a local activist group that is committed not only to raising awareness about peatland communities, but also implementing mitigation efforts on a community level in Kalimantan. Born and raised in a Central Kalimantan native Dayak community, Shinta witnessed many tragedies during the 2015 fires, such as the young girl collapsing on her bike due to lung failure. Shinta’s eyes glisten with moisture beneath her red sumping headpiece – at public events, she always dresses in traditional Dayak clothing – as she recalls how the fires were not only pivotal for the global environmental community, but also for her own life. The first peatland fires occurred in Kalimantan in 1997. By the time she moved to Palangkaraya in 2009 for her university studies, she said that everything had changed. The air no longer carried the scent of fresh forest, but the harsh stench of burning. Shinta felt called to action, and without any professional skills, she did what she could: cook. She and her friends gathered scraps of money from the community and prepared meals for the local firefighters who had been surviving solely on eggs and noodles for days. She also began documenting the crisis on film, to show to others elsewhere what was actually happening on the ground. From then on, her camera became her primary tool to help her community. Her latest documentary film, entitled When Women Fight, tells the stories of people who lived through the crisis firsthand. It was screened at the ASEAN People’s Film Forum in Timor Leste and at the Freedom Film Festival in Kuala Lumpur, Malaysia. But spreading information is only one part of her mission. She is also distributing anti-pollution facemasks and developing airtight rooms for when the air quality index level heightens again. The Dayak people, she said, define themselves as the “guardians of the forest” and they should recover this identity. As her work goes to show, perhaps this begins with becoming guardians of each other. In 2015, Indonesia was surprised, all the world was surprised. But we locals weren’t surprised. The situation had been brewing for 18 years. Indonesia is now the world’s largest producer of palm oil. However, when oil palm crops were first instituted on a mass scale, a requisite transfer of knowledge did not follow. As Eddy Saputra, a community leader from Sumatra, Indonesia, described in the Forum’s opening plenary, this crop has not been adequately tailored to the archipelago, let alone to the communities residing within it. Observations of the change in ground conditions, alongside the government’s ban on peatland clearing, led Saputra to begin seeking other ways for his community to profit from their land. But they weren’t familiar with other farming methods, and the expense of herbicide to fertilize land was unaffordable. “Not burning means higher costs,” he said. “And the government never gave us alternate solutions. It was a new environmental era, and it was up to him and his community to figure out how to adapt. In 2014, his community began planting rubber, and then in 2016, asked the government to help convert some of their land into rice paddies. They’ve also begun producing and marketing local handicrafts. His community has not used burning methods in recent years, and even through abnormally long dry seasons, their land has remained fire-free. Bagus, a leader of a fishing community in a flood-prone area of East Kalimantan, also witnessed a change for the better in the habits of his community. Every five years or so, he said, his community would be at risk of a wildfire if they weren’t vigilant, but normally they experience one or two major floods a year. “Flooding is a fortune for us, because then the fish will be abundant,” he said. His community was forced to question their centuries-old way of life a few years ago when a palm oil plantation bought and began clearing neighboring hectares of land. They didn’t want to give up their fishing economy, but conversations began with the local government on what to do with their land, revolving around the question: To sell, or not to sell? Rather than reacting, they decided to wait and observe. After all, it seemed unnatural to live off the land in such a flood-prone area – and this proved to be true. The plantation’s planting abilities were dictated by the flooding and the weather, leading to a lack of rhythm and lack of profits. Ultimately, Bagus’s community not only kept their land, but they went one step further and decided to ensure its protection, establishing 27,000 hectares as a conservation area. In Shinta’s words, they have become “guardians of the forest”.